In May 2017, The Institute of Flavourology (Gingerline) approached us about an exciting idea for a new project: a Starbucks immersive event. Commissioned by Starbucks, The Institute of Flavourology set out to create a unique experience, exploring the cold side of craft coffee. Using coffee to take subjects on a ‘sensory exploration of flavour, smell and texture’ inspired by Starbucks’ newest cold drinks. The Shoreditch-based venue was used to create four different areas: three ‘experimental’ areas – Regression Therapy, Social Activity and Sensory Stimulation – and one final briefing area called The Exit. Test subjects entered the ‘coffee bean ball pit’ via a slide and encouraged to remember the first moment they tasted coffee. 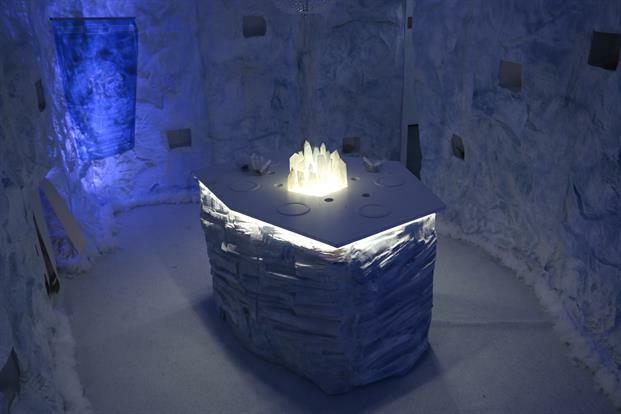 Subjects were asked to explore the ice cave as a team to find various ingredients to assemble their own dish. The final stage required the subjects to immerse themselves in all their senses; touch, sight, sound, smell and taste. The subjects were ejected from the experiment on a conveyor belt into the Test Facility’s briefing area where they were given an evaluation. In this space, we created a bespoke ‘roasting oven’, with fake heating elements to portray the coffee bean roasting room. We installed EVS40 speakers to play sound effects and ambient music. As this space was a more ‘chill out’ room, we supplied audio and a series of headphone jacks were distributed around the room playing calm music – encouraging patrons to sit and relax. We rigged automated lighting fixtures, and placed hidden buttons around the room that the experience host could press. When pressed it triggered cue stacks on Qlab4 to automate a variety of different lighting movements, coluors and patterns around the room. The way to exit the Sesnory Stimilation room was via a tunnel similar to an airport security roller platform. Using Philips IP strips for to line the tunnel, we created a space-esque lighting chase for the users journey back to the entrance.